In future industrial communication will depend on functionalities such as condition monitoring and predictive maintenance. It ensures process optimization through data acquisition and afterwards cost optimization through process optimization. 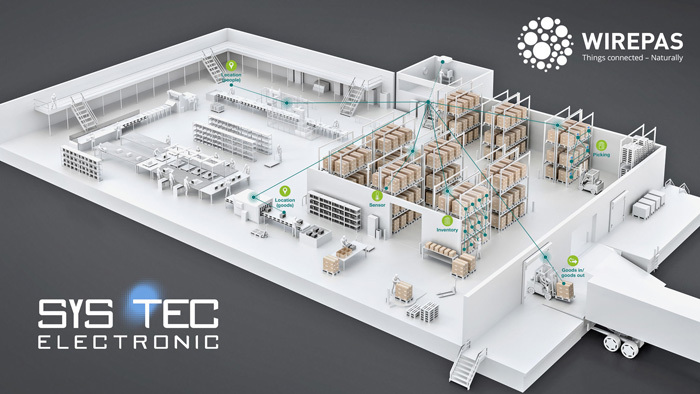 The new control system of SYS TEC electronic is developed among others for these applications. In addition to numerous interfaces, such as industrial inputs and outputs, TCP / IP, MQTT, Modbus, CANopen, USB and SD, the controller contains two Ethernet interfaces. This ensures the separation of Enterprise IT and Shop Floor OT. Asset Tracking: Where and in what condition is your cargo? Industry 4.0 - We make machines readable! 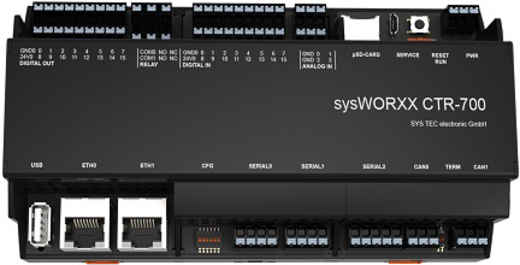 The special feature of the sysWORXX CTR-700 is the software. It can be programmed via IEC 61131-3 as well as in various IoT languages ​​(C#/.Net, Node-RED, Java, Python). Thus it is not necessary to require an expensive external service. The controller speaks the language of the employees. Via the backplane expansion bus, the sysWORXX CTR-700 can be easily integrated into mesh networks using our extension module. We use our partner software for this solution - Wirepas Connectivity. RFG stands for Radio Frequency Gateway, which enables the sysWORXX CTR-700 to communicate with mesh networks. Wirepas Connectivity Software provides a connectivity solution optimized for performance, bandwidth, range and latency. The technology is hardware-independent - the protocol runs on every wireless chip. The Mesh net solution allows customers to run the network on batteries for up to 15 years. With this MeshNet solution, they are able to flexibly optimize the connection solution for the application in terms of performance, bandwidth, range and latency. With the new TeamViewer IoT-integration for our sysWORXX CTR-700 you can now access your devices and make any necessary adjustments from anywhere and at any time. No matter, if you are at home, on the road or simply at a different spot with your office building. All TeamViewer versions use full encryption. Encryption is based on 2048bit RSA private/public key exchange and 256 Bit AES session encoding. This uses the same security level as https/SSL and is considered completely safe by today\'s standards. The key exchange also guarantees that the data transfer is completely encoded from client to client and that any routers or servers in between (including our routers) are unable to read or analyze the data stream. Security and privacy have always been a top priority during development.